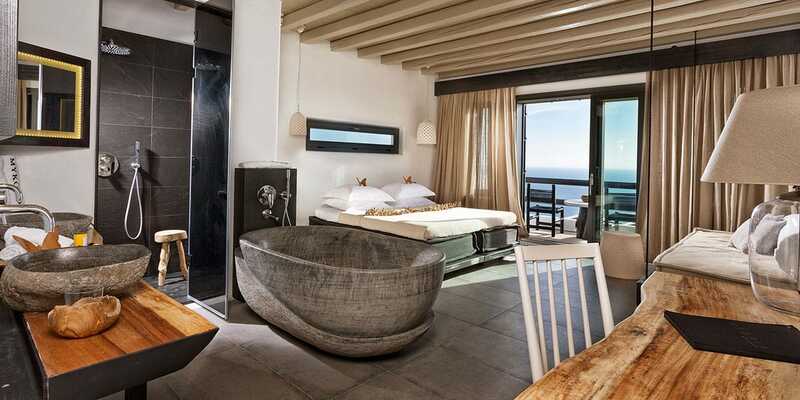 Set into the rock 300 metres above Elia beach, this luxury 5-star hotel in Mykonos combines the natural beauty of its location with modern opulence. A ‘green conscience’ underpins the structural use of locally quarried, hand-cut stone and sustainable materials, achieving a harmonious counterpoint to the iconic design pieces and customised furnishings of ultra-glamorous interiors. Utopia is a firm favourite with couples and honeymooners who seek a romantic getaway in a perfect setting, minutes from the longest beach on Mykonos. Relax in the world famous spa, or explore the local nearby town. Deluxe accommodation on Mykonos with spacious interiors and a furnished private balcony claiming panoramic views of Elia Beach and the Aegean. Features a designer bathroom with rain shower. Every comfort is considered, from fine cotton sheets and luxury cosmetics, to soundless air-conditioning, high-speed Internet and wireless docking stations. This room accommodates two guests and is also available with a private pool. Connecting rooms can be requested depending on availability. *Due to the particular structure of the property, small differences in the interior or the exterior might occur among the rooms of the same room type. Superior guestrooms with a generous living space of 35m² and a fully-furnished private balcony, commanding panoramic views of Elia Bay in Mykonos. Special luxury features include bathrooms with rain shower, stocked daily with exclusive products. Every comfort is considered, from fine cotton sheets and luxury cosmetics, to soundless air-conditioning, high-speed Internet and wireless docking stations. This room is also available with a private Jacuzzi and can accommodate up to 3 adults or 2 adults and 1 child up to 12 years of age. Connecting rooms can be requested depending on availability. Luxurious premium suites with spacious living areas, designer bathrooms that delight with sculptural stone-crafted tubs, as well as a fully-furnished private balcony with panoramic vistas of Elia Bay, all account for one of the best finds on Mykonos. Every comfort is considered, from fine cotton sheets and luxury cosmetics, to soundless air-conditioning, high-speed Internet and wireless docking stations. This room is also available with an outdoor Jacuzzi or a private pool. It can accommodate up to 3 adults or 2 adults and 1 child up to 12 years of age. Connecting rooms can be requested depending on availability. This room is also available with a Jacuzzi or private pool. A select number rooms in this category also offer a barbeque area and an equipped kitchen. It can accommodate up to 3 adults or 2 adults and 1 child up to 12 years of age. Connecting rooms can be requested depending on availability. The Grand Majestic Villa is the jewel in the crown. For guests seeking to unwind in pure luxury and privacy, with 5-star service and unparalleled views over the cosmopolitan Elia beach – look no further. Two master bedrooms, a living room, a kitchen and a dining area, all open out onto a fully-furnished 120m2 terrace with a large private infinity pool, outdoor Jacuzzi and a barbeque area. Highly efficient housekeeping and concierge services ensure that you will neither have to lift a finger nor a brow. Every comfort is considered, from fine cotton sheets and luxury cosmetics, to soundless air-conditioning, high-speed Internet and wireless docking stations. The Grand Majestic Villa is the home away from home you will wish you need never leave. With an expansive outdoors and a 135m2 interior, this Villa comfortably accommodates up to 5 guests and adjoining or nearby rooms can be requested if available. The Utopia Relais & Châteaux is poised high above Elia beach, one of the island’s longest beaches situated on the south coastline a mere 10 km from Mykonos town and about 13 km from the glamorous Psarou. Renowned for its aquamarine waters, stretches of fine sand and leisure activities, Elia is a destination in its own right, a place where ancient myths and modern legends come alive under the Aegean sun and starry nights. A wonderful selection of rejuvenating treatments and Thalasso pools await you at the Sanctuary Spa. Or refine your form in the state-of-the-art fitness room. Experience that is enjoyed throughout the day begins with a Mediterranean breakfast while taking in sweeping views of the Aegean from the Pavillion restaurant. The freshness of farm-to-table ingredients, including seasonal fruit, classical Greek yogurt, wild honey and farm eggs prepared à-la-carte, is complemented by home-made Myconian savoury and sweet delicacies, as well as freshly brewed coffee to sweep up the cobwebs of a night on the town. With the famous Myconian night as its curtain call, the Pavilion restaurant delivers a star performance every evening. A refined menu in the true gourmet tradition of Relais & Châteaux is complemented by spectacular sea views and, naturally, an exceptional wine list that includes both international vintages and a selection of rare gems from Greek wineries picked by an expert sommelier. The Pool Club is a spectacular perch with 360-degree views of Elia Bay, a perfect meeting spot that runs an all-day bar service. Kicking off with morning smoothies and fresh juices later followed by exotic cocktails and coffees, the Pool Club moves to aperitifs at sunset and culminates in serious bar culture after dark, complete with live music.